2018 Summer Recreation GuideMonday, April 16, 2018 Online registration is open! Over 20 NEW PROGRAMS for youth, adults and families! Creating an Active Lifestyle for Our Community! Imagine a world where every child can aspire to greatness and every adult can live a healthy, balanced life. Recreation facilities and parks represent the hub of a community where people of all ages play, rest, grow, and dream. 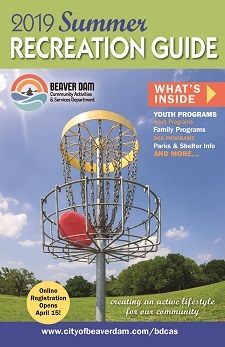 The City of Beaver Dam Community Activities & Services (BDCAS) Department is responsible for recreation programs, a multipurpose Community Center and park shelter/equipment rentals. Residents of all ages in the city and surrounding communities can participate in a wide variety of activities at a reasonable cost. Stay informed and "opt-in" to get cancellation information, reminders, BDCAS news,our We will send messages for weather-related or department cancellations, program changes, inform you of special upcoming events, etc. There's no charge to "opt-in", although regular text messaging rates apply for your cellular service.